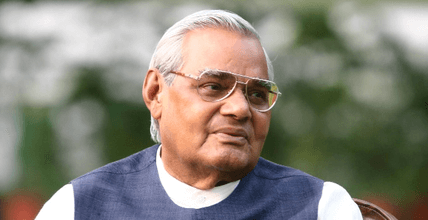 The trajectory of life of Mr. Vajpayee is very revealing as far as his political ideology is concerned, notwithstanding his friendly overtures to Pakistan and peace initiative in Kashmir. While much is being made of his oratorical skills, jocular nature and accommodative spirit, what is being underplayed is his political ideology, the sectarian Hindu nationalism for which he worked all his life. He joined RSS at an early age and became well known for his poem, Hindu Tan Man Hindu Jeevan. (Hindu body-Soul: Hindu life). This was the time when Indian identity was becoming the major identity for the people of India. He also wrote an article in RSS mouthpiece Organiser, outlining his political agenda, the title of this aptly was ‘Sangh (RSS combine) is my soul’. Later in an article on the web he claimed that he had participated in the freedom moment. This claim of his was debunked by investigation by Frontline and it turned out that he was a mere onlooker in the procession of Quit India movement in his village Bateshwar. As per his won confession he did not participate in the procession. He named the leaders of movement and was released from the jail in couple of days. He was a part of RSS, whose Chief had given the instructions to keep off the 1942 Quit India movement. As a loyal RSS worker he did not participate in Quit India movement.